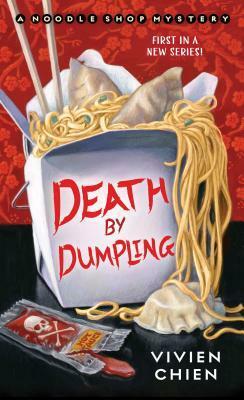 Death by Dumpling is book 1 in A Noodle Shop Mystery series. I had to try this when I saw it at my library. I've been on a cozy mystery kick lately but it's an Asian author with diverse characters, which means it's a must read for me! I've said this before and I'll say it again, we need more diverse characters and authors in the book world. Being someone that is mixed, I want to read more than just white characters, though at the same time I don't want a bunch of stereotypes. This novel starts out with Lana Lee returning to Cleveland after a bad breakup and leaving her job. She didn't expect to go back to working at Ho-Lee Noodle House, her family's restaurant, but the job market is rough and she's trying to find herself again. With the normal delivery person busy, Lana takes the order across the plaza to their landlord. She finds out not too long after that the dumpling he ate had seafood in it, which he's highly allergic to and went into anaphylactic shock. There's foul playing going on for sure so Lana is trying to clear not only her name from being the murderer but also the cook at her family's restaurant. There are quite a few red herrings involved in this novel but I did figure out who the killer was way earlier than revealed. The story itself was entertaining with twists and turns mixed in to make the reader question who the killer really was. This was a pretty solid debut novel and I can't wait to see what VChien comes up with next. Death by Dumpling had me craving Chinese food and also wanting to solve a mystery. I'll admit, the cover is what caught my attention in the first place but I'm so glad I gave it a go. I'll be interested in seeing if a romance blossoms in the next book but if not that's okay. All in all, if you like diverse characters and cozy mysteries that revolve around food you'll love this novel.